These 5 muscles are the key to exercising for a flat stomach -- Don't waste time training the WRONG muscles! "Spinal Stabilization + Proper Exercise Selection + a healthy Anti-Inflammatory Diet" is the key to a flat stomach; increase your metabolism by signaling muscle growth. From an exercise standpoint, the more you work the muscles that stabilize your spine, the faster you signal your body to lose fat and reduce your waistline. Think about your abs as your spinal cord protectors, even though they're on the other side. When you protect your body, it gets lean, and prepares to be able to withstand more. Your "six pack muscle" (rectus abdominus) is an after-effect of training the rest of your core. In some cases it's worth considering your Quadratus Lumborum when training your core, but we'll talk more about side-bending, which will affect your hip bone definition, in a moment. If you're training other muscles and you think you're exercising your core, you're training the wrong muscles. The reason that your body wants to see you train your abs in this order is because it is the best survival strategy. Protect your most vital organs, and above all else, protect your brain, spinal cord, and heart. When you train your 'true core' muscles in your abdomen, you are also tightening something called 'fascia.' Fascia is basically a connective web of tissue that lines every organ in your body, attaches muscle to ligaments, ligaments to bones, and acts as a protective layer for your entire body. Fascia runs through every aspect of your body, from your veins and arteries, all the way out to your skin. 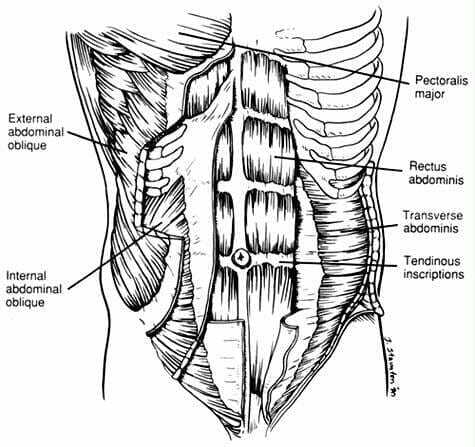 When you train your internal and external obliques, you provide greater stability to these muscles, but they also have a connective web of tissue that attaches them to your lower spine, called your Thoracolumbar Fascia. In other words, tighten your obliques and TVA, and you'll stabilize your spine through this fascia. Your multifidus , or multifidi for plural, are triangularly shaped muscles that are on either side of each spinal segment, and they help you rotate, or when working together, backwards bend. When you train these muscles, you are working directly on spinal stabilization, so you are signaling your body to get a flatter stomach. Lastly, we have your psoas. Your psoas is a hip flexor, and it begins on the front of your spine, or super deep in your abdomen. It's job is to help you bring your knee towards your chest, but when it's wound up, it forces your low back to extend instead. What should be helping you glide your knee towards your chest is now forcing other areas of your body to substitute movement and try to help out by accomplishing the motion. This causes a lot of undue stress on your low spine, and it goes against the goal of a flat stomach. As you can see, each of the 5 muscles has a specific purpose for protecting your spine, and assisting with multi-dimensional movement. That's what this is all about: 3D Movement. By moving in 3D, you are constantly forcing your body to train in a functional way. The real-world is 3D, it has bumps, grooves, and things that throw you off balance. Sometimes you have to walk up a hill, step over a pothole, or do some stairs. At times, you have to back up, move to the side, or reach and grab something on the opposite side of your body. Simulate real-world demands in your training program and your body learns to believe it needs to get leaner to get through your day. You know the saying: "Use it or lose it." Use it or lose it; but when you use it, grow it. Your body will grow and respond to any stress or demand you place upon it (Wolff's Law.) Exercise, when done in a real-world way, makes your body believe it requires greater strength, less fat, or more energy for its day. Your body adapts, and it helps you cope with your environment. On the other hand, when you train the wrong way, or in one or two planes of motion, you lose the 'meaning' behind your exercise program, and your body responds by halting or slowing your results. Interestingly, when you're working out, your Q.L., for short, has one more very important purpose -- holding your lower ribs down when you breathe in heavily. You can imagine how often you're using your Q.L. when you're training your core in an intense way. It's almost part of the same group of muscles, but the nature of this muscle is a bit different, in that it cannot sustain a muscle contraction for as long as the rest of your core. This way, when we pair the three exericses above with stabilization exercises, such as planks and bridges, we work all dimensions of our true core and truly stabilize our spines. Remember, there is a right way and a wrong way to exercise. When you exercise the right way, your body adapts by losing fat and giving you a flat stomach. Step 2 is to learn more about the FASTEST way to a Flat Stomach. the FASTEST way to a Flat Stomach <--- 3D exercise, explained.